Volume Boosters are out there, and this article will help you if you're frustrated with the poor audio from your old PC speakers. Don't hurry to buy new ones! A free software program can substantially improve the sound quality. It is known that the frequency response of ideal speakers must be flat or almost flat. However, the frequency response of relatively cheap PC speakers is not flat at all. If you would measure the frequency response of your PC speakers, you could see a lot of resonance peaks instead of the flat response as it is shown by the gray line in the figure below. All that resonances are created by the mechanical parts of the speakers and, at some extent, by acoustic reflections in the room. Every resonance substantially decreases the fidelity of the sound. Such resonances overload your ears at certain frequencies. Besides that, they "mask" all other spectrum components of the sound, so you don't hear them without a volume booster. Of course, you need a microphone to measure the frequency response of your speakers. Pro audio guys use measurement microphones like UMIK-1, that can be connected to the USB port of every computer. However, if your PC speakers are cheap, you can try to use a cheap PC mic which you have at this moment. You can also try to use the microphone of your headset. Cheap PC microphones usually have a better frequency response than cheap PC speakers, so you can use such microphones to correct the frequency response of your cheap speakers. However, if you are a true audiophile, measurement microphone is probably the most important thing in your hardware collection. The following measurement mics are most popular ones: MiniDSP UMIK-1, Dayton Audio UMM-6, Dayton Audio EMM-6 and NADY CM100. 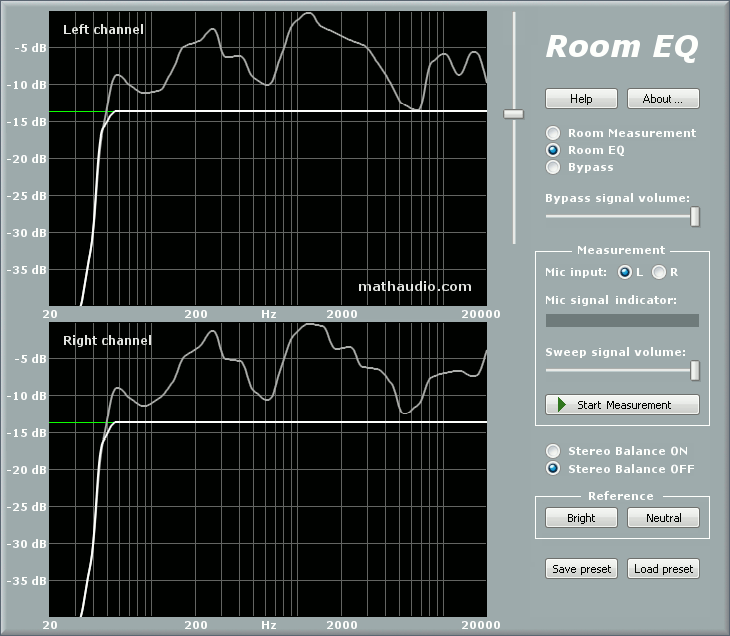 If you've found a suitable microphone, all other steps are simple and straightforward: just install the Foobar2000 player, then install the MathAduio Room EQ plug-in, then open the MathAudio Room EQ Help and follow the instructions. Does it mean that $20 speakers can sound as perfect as $2000 ones? Unfortunately, not. Too deep frequency response notches of cheap speakers cannot be compensated for because such compensation can cause too large excursions of the speaker diaphragm (see the frequency interval 20..50 Hz in the figure above). Besides that, noise and non-linear distortion of cheap speakers cannot be effectively suppressed by means of any software. Nevertheless, properly used signal correction software can dramatically improve the sound of all types of speakers. The manufacturers don’t know the acoustic properties of your room and, consequently, they cannot make a pair of speakers which will ensure the flat frequency response in your specific room. Hence, even the most expensive speakers can benefit from some digital correction.